Within 250 miles of Frisco, TX. This clinic is SOLD OUT! However, there is another clinic just 15 miles away! Sign up for the Lewisville, TX clinic on September 28 & 29 with Olympic gold medalist Jack Conger! 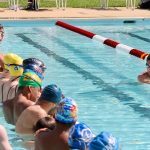 Give your swimmer the opportunity to get ahead of the competition right from the start at this High Performance FFT Swim Clinic. Two-time Olympian Cammile Adams and Olympic gold medalist Clark Smith will be in the water teaching your swimmer technique for FASTER starts, underwater dolphin kicking, and breakouts as well as mental preparation for more confidence when your swimmer steps on the blocks! Cammile’s dad, Eddie Adams, will lead a special discussion session for the parents! Step up on the blocks with more confidence by learning from two-time and Olympic gold medalist Clark Smith and Olympian Cammile Adams. She will be in the water working with participants to become more explosive off the start, more powerful and efficient in their underwater dolphin kicking, achieving a streamlined breakout, and how to be more mentally strong swimmers. START: Get off the blocks faster and with more speed and power by learning the techniques of Cammile Adams! Your swimmer will learn to set up on the blocks in a position that will allow them to explode forward. Make sure to be fuly engaged in the air as you throw your hands forward into a tight streamline. Your swimmer will learn drills and exercises that will help make them faster at this clinic! UNDERWATER DOLPHIN KICKING: The fastest swimmers in the world dolphin kick off of their walls and breakout ahead of the competition. It's not as hard as you think. Cammile will help swimmers improve their technique by learning how to use their core to generate more power and dolphin kick further off of every wall. BREAKOUTS: Learn how to cary momentum from the underwater dolphin kicks into the breakout by timing the first stroke properly and staying streamlined. Your swimmer will practice keeping their head down and it'll make a big difference in their breakout! MENTAL PREPARATION: A swimmer's biggest obstacle preventing them from taking their swimming to the next level is often found between their ears. Cammile will lead a discussion on helping swimmers unlock their hidden potential by creating new positive thought patterns and learning effective goal setting strategies. What your swimmer learns in this session will be invaluable. See your swimmer become a more confident person in every area of their life! Watch one of the best swimmers in the world swim at top speed - achieved by practicing the same drills Cammile will teach you. Then, have the opportunity to swim ALL OUT and put your newly developed skills to the test of fatigue! Take a photo while wearing Clark and Cammile's medals, get autographs, and a gift from TYR Sport!